Nissan started the production of the first big engine of the VQ-series in 1994. It was the VQ30DE engine. The engine replaced the VG30DE and the VE30DE. The engine has 60° V-shape aluminum cylinder block. The block height is the same as VQ35, and it is 215 mm. Connecting rods length is 147.6 mm. VQ30DE pistons are more massive than VQ35DE pistons. There are aluminum cylinder heads on each cylinder bank. Each head has two camshafts and 12 valves. Valve lift of the original VQ30DE is 8.55/8.55 mm, duration - 232/232 (single pattern cams). The crankshaft drives camshafts by the reliable timing chain. The VQ30 doesn't have hydraulic tappets/lifters. The special version with direct fuel injection - the VQ30DD was produced from 1997 to 2004. The compression ratio of this engine is 11:1. 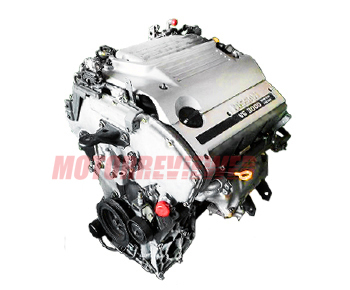 For more power, this version is equipped with variable valve timing system (CVTC) and variable geometry intake manifold. In 2000 the VG30DE engine was redeveloped and named as VQ30DE-K. This engine has new exhaust and intake manifolds. Camshafts specs: duration - 224/232; valve lift - 8.55/9.0 mm. Let's say about turbocharged version VQ30DET. Of course, the engine has reinforced connecting rods and crankshaft, new pistons for lower compression ratio (9:1), the exclusive intake manifold and headers. Garrett M24 plays the turbocharger role. The boost of stock VQ30DET is only 0.5 bar. All these parts help to output 280 hp of power and 285 ft-lb of torque. The 3.0l VQ30 engine is very reliable. The first production year engines are very simple and cheap in repair. The common problems are similar to VQ35.